Definition: Shingles is a viral infection that causes a painful rash and affects one side of the body, typically the face or torso. 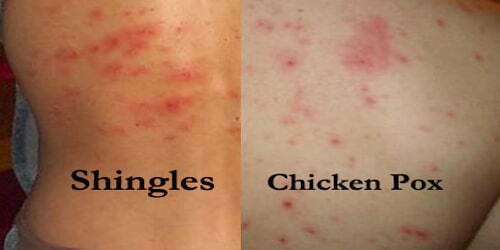 It is caused by the varicella-zoster virus (VZV), the same virus that causes chickenpox. Shingles is most common in people over the age of 50 years. However, the virus may reappear in people of all ages who have previously had chickenpox. The family name of all the herpesviridae derives from the Greek word herpein (“to creep”), referring to the latent, recurring infections typical of this group of viruses. 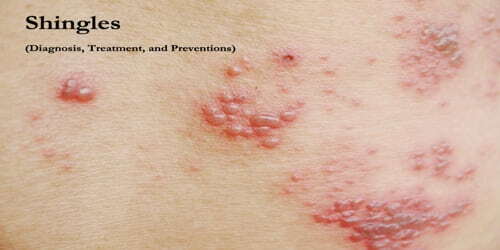 Zoster comes from Greek zōstēr, meaning “belt” or “girdle”, after the characteristic belt-like dermatomal rash. The word shingles come from the Latin word cingulum, which means belt. In Arabic its name means “belt of fire”, while in Spanish it means “small snake”; in Hindi, it means “big rash” and in Norwegian, its name is helvetesild, literally “hell’s fire”. Though most people who develop shingles will only have a single episode, there are some who develop recurrent cases of shingles. Shingles is more common in older individuals and in those with weakened immune systems. Shingles typically resolve within 2 to 4 weeks, and most young, healthy individuals make a full recovery. Approximately 1-4 percent of people who develop shingles require hospitalization for complications, and 30 percent of those have impaired immune systems. It is estimated that there are about 96 deaths per year directly related to the varicella-zoster virus. Most which occur in older adults and those who are immunocompromised. Diagnosis and Treatment of Shingles: Shingles is most often diagnosed by the doctor solely based on the appearance of the characteristic rash. However, herpes simplex virus (HSV) can occasionally produce a rash in such a pattern (zosteriform herpes simplex). The Tzanck smear is helpful for diagnosing acute infection with a herpes virus but does not distinguish between HSV and VZV. Diagnosing shingles before the appearance of the rash or in cases of zoster sine herpete (zoster without rash) can be challenging. In cases where the diagnosis is unclear, laboratory tests are available to help confirm the diagnosis. Depending on the clinical situation, testing can be done using either blood work (to detect antibodies to the varicella-zoster virus) or by specialized testing of skin lesion samples. Nested PCR test has high sensitivity, but is susceptible to contamination leading to false positive results. The latest real-time PCR tests are rapid, easy to perform, and as sensitive as nested PCR, and have a lower risk of contamination. They also have more sensitivity than viral cultures. Products such as Calamine lotion, which is available online, can soothe and relieve the itching. 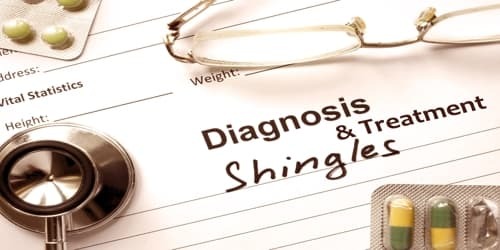 Shingles are most commonly diagnosed and treated by a primary care physician (family practitioner, pediatrician, and internist) or an emergency medicine physician. For certain individuals who develop complications of shingles, a specialist in ophthalmology, neurology, or infectious disease may also be involved. Vaccine and Preventions of Shingles: Two vaccines may help prevent shingles — the chickenpox (varicella) vaccine and the shingles (varicella-zoster) vaccine. Chickenpox Vaccine: Immunization with the varicella vaccine (chickenpox vaccine) is now recommended for adults who’ve never had chickenpox. It is a two-dose vaccine, given once between the age of 12 and 15 months and again between 4 and 6 years. Shingles Vaccine: People looking to receive the shingles vaccine have two options: Zostavax and Shingrix. The most common side effects of either shingles vaccine are redness, pain, tenderness, swelling and itching at the injection site, and headaches. Since vaccination started in children, the number of shingles cases has dropped significantly. The shingles vaccine is used only as a prevention strategy.